The Skyway Bridge over Tampa Bay has been reopened, the Florida Highway Patrol said in a statement on Monday evening. Between 2,000 and 3,000 utility workers from out-of-state are staying at BB&T Stadium in Broward County stadium that is home to the National Hockey League’s Florida Panthers, said Gus Beyersdorf, 40, of De Pere, Wisconsin, who was inspecting power lines in Fort Lauderdale on Monday. “Each one of us has a cot, a single foot apart,” said Beyersdorf. “All you smell is feet and farts. I slept in the truck last night just to get a break from it,” he said on Monday afternoon. Retiree Tony Denito, 71, of Homestead asked why so many people had lost power when FP&L was paid to cut down trees to avoid outages in the first place. Now he said the utility would get paid at a higher rate by FEMA to clear away trees it should have already trimmed. "They're not doing an efficient job - why should they?" he said. Scott says it is positive to see that people took shelter in the almost 600 shelters that were opened. The Department of Transportation is working hard to ensure highways safety and bringing the fuel back is another priority, Scott says. Scott: "Homeland Security, FEMA, the president and vice president - they've been great partners." Historic flooding inundated downtown Jacksonville in Irma's wake. Authorities were rescuing people into the afternoon, officials said on social media, while the National Weather Service warned that water levels along the St. Johns River in some places could take a week to recede. 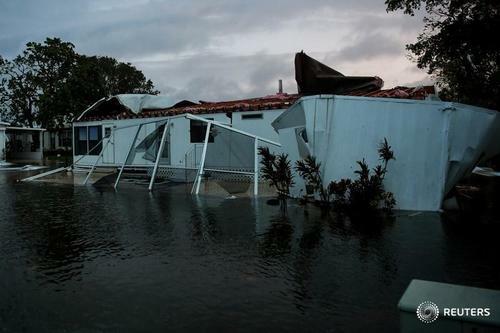 In nearby communities on Florida's east coast, Irma left a house collapsed into the ocean, flooded residential streets almost to the mailboxes and ripped apart rooftops, images posted by St. Johns County Fire Rescue showed. It's hard to tell that Miami avoided the brunt of hurricane Irma at the Trinidad trailer park in Little Haiti where some residents began picking up debris and repairing there mobile homes while others lost everything. Nearly all of the trailers in the mobile home community sustained damaged with some completely destroyed. People began sifting through debris as they made their way through the flooded streets of the community. After the storm, Ladesse Lamay, 58, returned home to a giant hole in the roof. "I don't kow what I am going to do. I need money to fix my roof and I have no money," she said. Melida Hernandez,67, found her home split down the middle by a tree when she returned home from the church she stayed at during the storm. "I wanted to cry but this is what it is, this is life," she said. Nearby around Naples, residents and authorities encountered flooded and debris-strewn streets as they began to survey the damage. 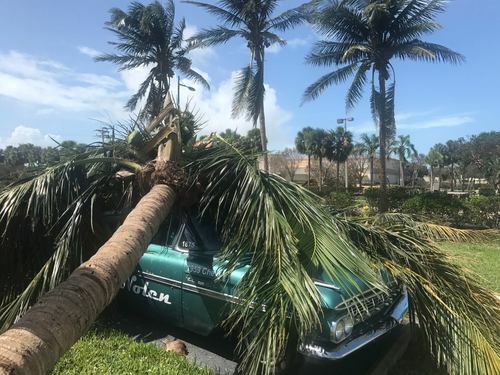 Metal paneling had been stripped from a roof by wind gusts, and shredded tree limbs covered yards, images posted by the Naples Daily News showed. Flooding and damage also appeared extensive in Everglades City. Images coming out of Marco Island, where Irma made its second landfall in Florida, showed substantial wind damage. Roof shingles covered the parking lot of a waterfront restaurant, the Snook Inn, whose tiki hut was destroyed, according to video from local television station NBC2 News. At a nearby trailer park, a residence was demolished. City officials said in a statement on Monday morning that access to the island was restricted while they assessed the damage. Florida National Guard troops and Orange County firefighters rescued 149 people from about 60 to 70 homes in a neighborhood in western Orlando that flooded overnight, National Guard Captain William Hollifield said from the scene. Another 10 pets were saved, he said. Calls came in around 2:30 a.m. and rescues were carried out with National Guard trucks and Orange County Fire Rescue boats throughout the morning. Nearby Lake Venus overflowed into the neighborhood, trapping some people In their homes. Besides the 149 people taken to a nearby middle school shelter, about 50 more were plucked from their homes, some of which were filled with 2 feet to 6 feet of water, said Orange County Fire Rescue Lieutenant Wayne Dorminey. One of the last people to come out was Billy Munnerlyn, a 41 year old landscaper who stayed behind to look after his five dogs. "I couldn't take them all out and I couldn't leave them behind," Munnerlyn said. "I don't know what to do now. Hopefully a friend can take them until I can figure out what to do with my house." Power companies and gasoline stations are coordinating response as Florida Power and Light trucks rely on stations that have not lost power, where they can refuel, so that electric workers can then restore power supplies elsewhere, said Ned Bowman, executive director at the Florida Petroleum Marketers and Convenience Store Association, which represents 98 percent of fuel sold in Florida. FEMA Director Brock Long, in several television interviews, said he was most concerned about people not heeding warnings from local officials and urged potentially residents in the U.S. Southeast and Atlantic coastal regions to remain vigilant. "The system's not done," with winds driving storm surge as the system pushes through along the East Coast, Long told MSNBC. "It's not over unfortunately." Residents of Miami's Brickell neighborhood began emerging from their apartment buildings Monday morning to survey the damage from winds and widespread flooding that whipped through the financial district. Yet it seems like the neighborhood was spared the worst considering many high rises sit about two hundred yards from Biscayne Bay. Meanwhile, residents also trawled around town looking for a bite to eat, and many clapped for joy when they came upon La Sandwicherie, a French café best known for serving overstuffed sandwiches until all hours of the morning. "We were open on Saturday and I said then I would reopen as soon as possible," owner Olivier Farrat said as he layered brie cheese onto a toasted croissant. "We didn't get lucky, we got super lucky." Alan Warner had to do something. He went to two nearby shelters asking if they there needed help Monday morning after Hurricane Irma ripped through the Tampa Bay area. They didn't. So Warner, 70, set to work sweeping the road in front of his house clear of debris. "I might as well be out here instead of my dark house," Warner said as he whisked piles of leaves and branches with a push broom to the edge of the road. Warner rode out storms before. There was Charley and those group of storms more than a decade ago. And there was Hurricane Elena in the 1980s as well. "It could have been a lot worse," he said. Warner, who was shirtless, wearing red suspenders and a black pair of Crocs, wondered if he should be out at all, but he couldn't sit around inside. "There's always something you can do about something," Warner said, as he continued to sweep. Insurance shares rallied after loss estimates for the industry were cut. Florida insurers Federated National and HCI Group were up around 14 percent in early trade and Universal Insurance was 16 percent stronger. Europe's insurance index, meanwhile, was the biggest sectoral gainer, up 2 percent. 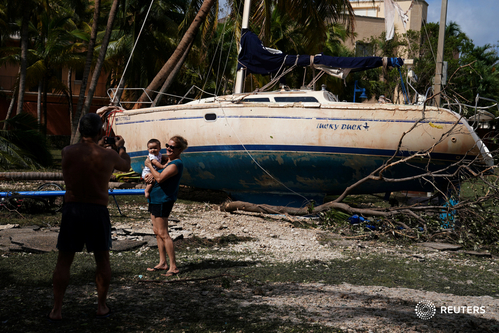 The index set for its best day in more than four months after the estimated U.S. insured loss from Irma was reduced to $20-40 billion from $15-50 billion. The top of a golden arch hung from a tree at one McDonald's restaurant in Kissimmee. But the Country Club Village mobile home park survived, albeit with some roofs and siding torn. One Sunoco gas station sustained significant exterior damage. Valerie Gilleece, 55, a restaurant server, and her husband were two of the few who defied an evacuation order because he is wheelchair bound and insisted on staying home. "I'm just thanking God to be alive. I wanted to go from the start but he's stubborn as hell and didn't want to go. Finally he agreed to go to the clubhouse." 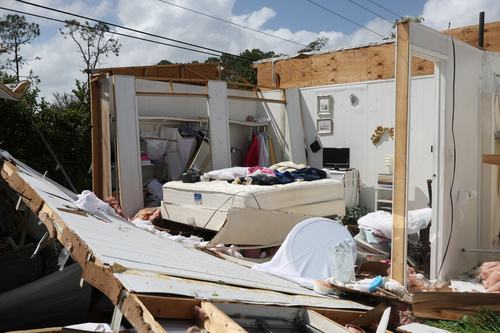 Their mobile home only lost a few shingles on the roof." 13.2 percent of all Atlanta gas stations are out of gasoline, according to Gas Buddy, up from 12.2 percent last night. Port Everglades is working with the cruise lines to determine how to best accommodate cruise guests who are returning this week. Cruise passengers should continue to check with their cruise lines for the latest information on upcoming itineraries. Port Everglades, South Florida's main petroleum delivery hub, it will reopen following completion of a damage assessment and approval from the U.S. Coast Guard, according to a statement. Petroleum terminals at the port keep storm reserves consisting of a four-day supply of gasoline and five days of diesel fuel, which can be distributed by trucks when the terminals reopen. Fuel ships are standing by to refill the terminals when they reopen to ocean-going vessels. Florida receives most of its gasoline by ship, as it does not have any refineries. President and CEO of Royal Caribbean Cruises Michael Bayley said the company was allocating four ships for humanitarian aid after having to divert eight ships because of the storm. One ship on Sunday was escorted to Saint Martin by the Dutch Navy and evacuated about 320 locals and tourists who needed help while also offloading water and other provisions, he told ABC news in a television interview. Another ship is headed to the Virgin Islands, where it was expected to evacuate about 2,500 to Puerto Rico to seek flights out of the area, he added. 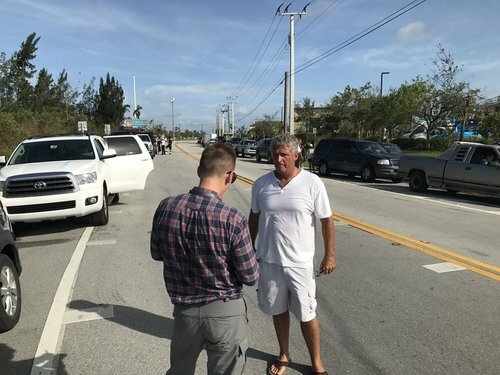 Another ship was planned for Key West as soon as the area was deemed safe, Bayley told ABC. After a terrifying night bunkered in her house in St. Petersburg, Florida with her children and extended family, Julie Hally emerged with relief on Monday morning. The winds keeping her up all night had toppled some large tree branches and part of a fence, but her house was undamaged. COLOMBO The death toll from the Easter Sunday suicide bombing attacks on churches and hotels in Sri Lanka rose to 359, police said on Wednesday without providing any further details.